I met up with a friend who’d I’d not seen in a while recently. He’d bought me a book for my birthday (Steven Pinker’s The Sense of Style: The Thinking Person’s Guide to Writing in the 21st Century) and asked if I’d gotten round to reading it. I admitted that I hadn’t – that the subject matter was too academic for my current mood. “So what’re you into right now?” he asked. “Homer” I replied – at which he proceeded to laugh his head off. It was only when he started laughing that I realized that in a lot of people’s minds, Homer is THE CLASSICS in all their symbolic weightiness and impenetrability. But I came to Homer, specifically the Odyssey, very recently and out of curiosity, not because I was ever compelled. And what drew me in at first wasn’t even the story, but the rhythmic, sea-thrumming verse of Robert Fitzgerald’s translation. When I was first reading it on the bus or train, I found myself book-marking pages so when I could get home, or got a chance to hide in a bathroom compartment, I could read the words out loud, letting the syllables roll around my mouth and off my tongue like stones thrown down a well. The best way I can describe what I find so compelling in the Odyssey and the Iliad is the reality of it. That moment where you feel you just can’t take it anymore, where it’s all just too much, how do you go on? There it is. Beautiful, brutal, real and life-affirming. Odysseus is a war-hero, the man who engineered the Trojan horse, but he’s also a broken man, wrecked by years of toil and misfortune at sea, driven by bitter and resentful gods. He’s a “master-mariner and tactician” but he’s also deceitful and manipulative – he draws comparison’s to the countless Trickster gods that litter the history of mythology. And he’s a father longing to rejoin his family, but he’s also a completely ruthless and bloody murderer: on his return home, he not only slaughters the men who were trying to woo his wife, but the ladies of his household who slept with those men or were even rumored to have done so. Homer makes no apology for the countless paradoxes and complexities that exist in the characters of his stories – he doesn’t simplify or beautify how messed up and how amazing people and the world can be – he simply presents reality in all it’s pain and glory. And there’s nothing “academic” about that. I wanted to write this out as I was having trouble finding this particular except of MacNeice’s “Autumn Journal”. As a poem in itself, this excerpt is one of my all-time favourite pieces of literature – it’s just the most romantic, beautiful, human expression of love I’ve ever read. to narrow possessiveness, jealousy founded on vanity. and that the ranks of men are ranks of men, no more of cyphers. but a ladder of angels, river turning tidal. the things that make you different? on boats, on trains, on roads when walking. or could be balm or manna. smoking stubs your lips had touched with crimson. when neither the pros nor cons affect the pulses. The live concert as a single, uninterrupted experience. I went to see Sharon Jones & The Dapkings last night. Among other things, it reminded me a lot of James Brown’s 1962 album “Live at the Apollo”. I mean there’s the horns, the backing singers, the R&B. It was an immensely fun experience and was the closest thing I’ve seen to what I imagine the “Live at the Apollo” show was like. I’d been listening to the fantastic Sound Opinions podcast retrospective on the Brown album and one of the things that was raised was how Brown created the show that was recorded at the Apollo – but performed countless times before and after – with the aim to make a show that was absolutely arresting in every way, something that was absolutely seamless and completely engrossing and that would hold the audience in thrall throughout the show. One of the key elements to doing that was having a show that was so polished, so perfectly performed, so well scripted that you simply had no reason or desire to look away. Even the interludes in the show, short 15 second intervals where Brown was gathering himself, are tightly choreographed with music. By now if you’re a music fan you’ll have heard the complaint that digital music has killed the album – that being able to pick and choose songs means we’ll never see an album that’s as seamless as, for example, Dark Side of the Moon, again. And as an extension, it’s generally agreed that live performance is much more important today as a source of income for an artist. But the way artists are performing live hasn’t really changed along with the shift, as far as I can see. If live performance’s significance to an artist has increased, surely the amount of craft put into a live performance should increase accordingly. I’d say about 99% of concerts I’ve been to have followed the format – song played by band, between songs the singer introduces the song/thanks the audience, band plays next song, rinse and repeat. Perhaps there’s two songs in a row without the patter, but there’s always a break of some kind. There’s always a pause where the audience can catch it’s breath and remember that they’re not elsewhere, that they are, in fact, just at a rock concert. That seems like a missed opportunity to me. So why not think of your live show as a single unit, with the aim of being totally engrossing throughout – what about aiming for 45 mins of seamless choreography, music, sound, light – relentless, uninterrupted entertainment? I guess my point is that I know I’d spend serious money to have a concert experience today like the one James Brown rolled out in 1962. And I know I’d be telling everyone I knew about a show like that – just like I’m telling everyone about how great the Dapkings were last night. That kind of completely immersive escape is what everyone needs now and then. My grandfather, Sean O’Boyle, died 35 years ago today. He was a sound archivist for the BBC in the 1950s during the advent of portable tape recorders, charged with collecting in recorded form “for the purposes of broadcasting, as much of the surviving folk music and local forms of speech as possible” from around Ireland. 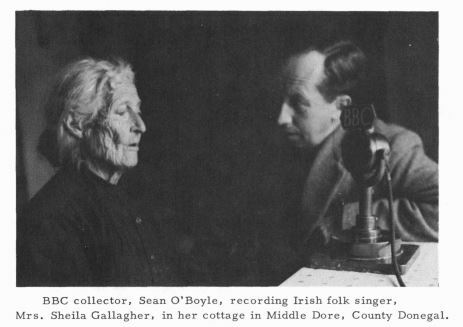 The picture is from the summer of 1953 – Mrs Gallagher (over 90 years old) performed 30 songs from memory over 3 hours, 10 in English and 20 in Irish during this recording session. like the lugs on a drum skin. as the mice run away from your feet.